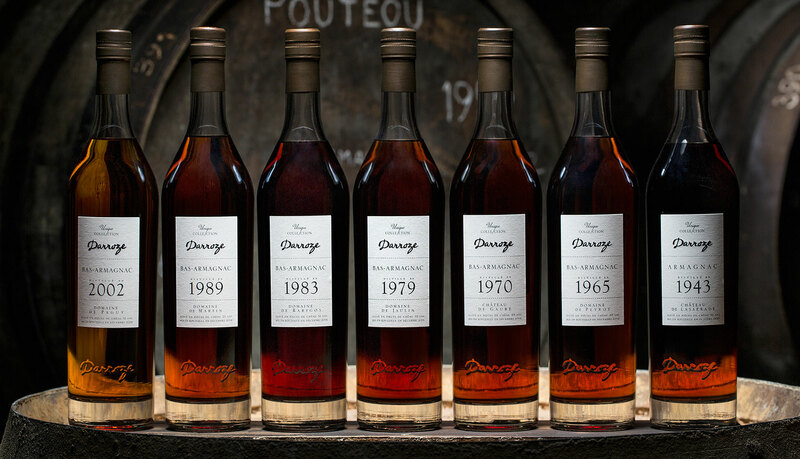 In the Armagnac region, when one decides to sell a product in its original vintage, the law requires a minimum of 10 years ageing in oak barrels. The desired balance between flavours, tannins and alcohol is actually reached after 15 years. We bottle only when we receive an order so as to maximise the ageing phase. Indeed, once bottled and unlike wine, Armagnac no longer ages (this is true of all spirits). For this reason we always include the date of bottling on the label, which attests to the real age of the armagnac. To blend their eaux-de-vies in order to make a common product, thereby wiping out all the characteristics that the soil, climate and the varieties have given. Each Bas-Armagnac offered is different and respects the work of the wine grower by reproducing the name of the property on the bottle. To blend different vintages. Each year gives an Armagnac with different characteristics. This is why the original vintage is reproduced in order to preserve, as much as possible, the diversity of the products in the region. To add water to their spirits in order to reduce the alcohol content. In fact, by diluting Armagnac with water (authorised practice), one dilutes the aromatic potential and erases the differences of one terroir as opposed to another. It’s like removing the powerful influence of the soil on the product, which is one of the most interesting things about Armagnac.